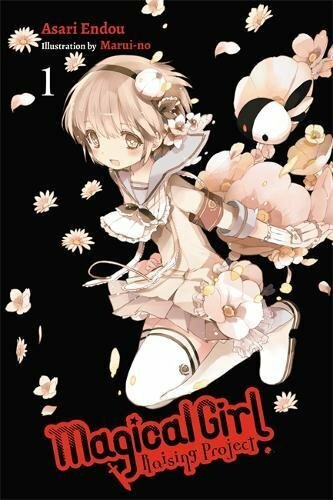 This review is for the first volume of Magical Girl Raising Project. This series is written by Asari Endou and features illustrations by Marui-no. The second volume is set to release November 14, 2017. There are 10 volumes in Japan at the moment, plus two side story volumes. I wasn’t too sure what to expect from this story when I first heard about it. There was an anime adaptation a while back, but I didn’t recall many people watching it–and those who did watch it didn’t seem to care all that much for it. But then Yen Press announced a license for the light novels. Was there a larger group of fans for this series than I thought? Whether there is or not though, I’m glad I gave this a read. It turned out to be a highly entertaining thriller. The premise for this is there’s a popular smartphone game called “Magical Girl Raising Project,” and 16 random winners get to become magical girls in real life. The story follows these 16 characters, who are tasked to earn points and try to become the #1 kindest, most helpful magical girl in the city. Things take progressively darker turns though as the game’s mascot character eggs on the players to obtain points by any means necessary (i.e. stealing the points from their fellow magical girls). Faster than you can say “that escalated quickly,” the game turns into a full-blown battle royale. I will admit that death game scenarios are a bit of a guilty pleasure of mine. (I am, in fact, playing Dangan Ronpa V3 as we speak.) One of my complaints for many action stories is that I don’t feel like the characters we’re following are ever truly in danger, because the author will just have all the heroes “tough it out” and be perfectly fine in the end, even if they get shot by arrows a dozen times or some nonsense. So the death game setup at least gets me to wonder if certain characters are actually going to make it through alive, and that’s a strong hook. I recommend this more to those looking for a dark thriller, rather than a traditional magical girl story. I’ll also say it’s well-worth a try for any light novel readers looking for something a little different from the norm. The translation is good, the artwork is good, and the story’s pacing is good. Give it a read, and see if any of your favorite characters survive!